Ghost (Track Book 1) - Kindle edition by Jason Reynolds. Children Kindle eBooks @ Amazon.com. Sometimes a whole life can change in one night. For seventh grader Castle Cranshaw, that night was three years ago when his father tried to shoot him and his mother, when "the liquor made him meaner than he'd ever been." That's when Castle started to call himself "Ghost," because Mr. Charles, who let the terrified pair take refuge in his all night store, "looked at us like he was looking at two ghosts." And that was the night he learned how to run... really run. Jason Reynolds (As Brave as You) has a playful, intimate and conversational style, and in Ghost, a middle grade series debut, he tells the story of how an unforgettable flight of terror led to an African American boy's instinct to run fast. One day on his walk home, Ghost sees a track team practicing with their short bald coach who looks like "a turtle with a chipped tooth." Keenly observant Ghost becomes annoyed with one of the runners others perceive as unbeatable, and decides to "keep up with him, if not beat him" even though he "ain't ever had a running lesson." He stubbornly persists until the coach relents: "Listen, you get one run, you hear me?" The story of Ghost's evolving relationships with his anger, with his ever worried mother, with Coach Brody and with running is a joy to read. For a boy who's "got a lot of scream inside," Ghost can riff entertainingly on topics from eating sunflower seeds to 100 meter sprints. Ghost is about kids who are, in both senses, running for their lives, and the generous souls who help them along the way. Discover: In Jason Reynolds's excellent middle grade novel, a boy learns to run when his father shoots a gun at him and he never stops running. This is a generalization, but in my experience librarians really enjoy reading within their comfort zones. They’ll travel outside of them from time to time but always they return to the books that they like the most. Children’s librarians are just the same. The fantasy readers stick to fantasy. The realism fans go with realism. Graphic novel readers with comics. When I served on a yearly committee of librarians in New York I’d notice that some books were difficult to get anyone to read. Horse books, for example, just sat on our shelves untouched. Nonfiction could take some prodding. And as for sports books . . . forget about it. Nobody ever got near them. Still, you can’t give up on them. Mike Lupica and Tim Green may rule the field but that doesn’t mean other people don’t make a lot out of athletics. If our Newbery winning The Crossover by Kwame Alexander taught us anything, it was that. Now Jason Reynolds, a young adult author until this year, has produced a middle grade novel centered on that must unlikely of sports: track. It skirts the clichés. It dodges the usual pitfalls. It makes you care about a kid who keeps messing up over and over and over again. It’ll make you like sports books, even if you can’t generally stand them. And now we’ve got to find a way to get a lot of it into the hands of kids. Stat. Call him Ghost. You can call him Castle Crenshaw if you want to (that’s technically his name) but he’s been calling himself Ghost ever since the night his dad got drunk and threatened Castle and his mom with a gun. Ghost learned to run that night and you might say he’s been running ever since. He’s got a load of anger inside that he doesn’t know how to deal with so he tends to take it out on others at school. Then one day he spots a track warm-up and takes an instant dislike to the albino kid in the expensive tracksuit. Without thinking about it twice Ghost beats the guy on the track, running on the outside, which gets the attention of the coach. Coach begs Ghost to join and Ghost reluctantly agrees but it isn’t what he expected. The other kids there all have their own lives, few of them easy. The running is much harder than anything Ghost has ever experienced before. And then there’s the fact that no matter how fast he is, Ghost can’t run away from trouble. It follows him and if he’s not careful it’s going to follow him right onto the track. Baseball. Basketball. Even football. These are the sports of fiction. I doubt anyone has ever run any statistics on it, but if you were to gather together all the children’s sports books and group them by type, the baseball books would undoubtedly outweigh all the others 2:1. That’s because baseball is a game with a natural rise and fall to its action. Basketball has speed and football has brute force, all good things when writing a story. Track? In track you run and then you stop. At least that’s how I always looked at it. For Jason Reynolds, though, it’s different. He didn't write this book with track as a single focus. He looks at what the sport boils down to. Basically, this is a book about running. Running from mistakes (forgive the cliché), from very real threats, for your life, and for your team. Why you run and where you run and how you run. And if that's where you're coming from, then track is a very good choice of a sport indeed. On paper, this book looks like it’s the sort of story that’s all been done before. That’s where Reynolds’ writing comes in to play. First off, it’s worth noticing that Mr. Reynolds is blessed with a keen sense of humor. This comes to play not just in the text but also in little in-jokes here and there. Like the fact that one of the runners (that, I should mention, gets cut later in the book because his grades are slipping) is named Chris Myers. Christopher Myers is the son of Walter Dean Myers, and a friend to Jason Reynolds. I love Jason's descriptions too. Mr. Charles at the corner store, “looks just like James Brown if James Brown were white. . .” Or Ghost saying later, “… for something to make you feel tough, you gotta be a little bit scared of it at first.” There are some pretty fantastic callbacks hidden in the story as well. Right at the start, almost like it’s some kind of superhero origin story, we hear how Ghost heard the gun go off that night he ran away from his home with his mom and “I felt like the loud shot made my legs move even faster.” That ties in beautifully with the starter pistol that goes off at the very very end of the book. But maybe what I like the most about Jason Reynolds’ books is that he applies this keen sense of the complexity to his characters. I don’t think the man could write a straight one-dimensional villain to save his soul. Even his worst characters have these brief moments of humanity to them. In this case, Ghost’s dad is the worst character. You don’t get much worse than shooting at your wife and kid after all. Yet for all that, Ghost still can't help but love the guy and eats sunflower seeds in his memory. Each character in the book has layers that you can peel away as the story progresses. Even Ghost, ESPECIALLY Ghost, who makes you want to yell and him and cheer for him, sometimes at the same time. There’s been a monumental push for increased diversity in children’s literature in the last few years. Diversity can mean any number of things and it often focuses on race. In a weird way, increasing the number of racially diverse books on a given publisher’s release calendar isn’t hard if the publisher is dedicated to the notion. Far more difficult is figuring out how you increase the economic diversity. Middle grade characters are almost always middle class. If they’re working class then they tend to be historical. Contemporary lower income kids in realistic novels are almost unheard of. For example, how many books for children have you ever read with kids living in shelters? I’ve read just one, and I’m a children’s librarian. So I watched what Reynolds did here with great interest. Ghost isn’t destitute or anything but his single mom makes ends meet by working long hours at a hospital. Middle class kids are remarkably good at ignoring their own privilege while kids like Ghost become almost invisible. In the book, Ghost’s decision to initially race Lu isn’t solely based on how Lu struts around the track, thinking he’s the bee’s knees. It’s also on his clothes. “…Lu, was decked out in the flyest gear. Fresh Nike running shoes, and a full-body skintight suit . . . He wore a headband and a gold chain around his neck, and a diamond glinted in each ear.” Later Ghost makes a decision regarding a particularly fancy pair of running shoes. That’s an economic decision as well. Those are the most obvious examples, but the book is full of little mentions, peppered throughout, of where Ghost’s class comes in to things. It’s nice to see an author who gets that. We are often affected by forces outside our control, forces we don’t even necessarily notice, particularly when we’re children. If young readers see it, they’ll be reading between the lines, just like Reynolds wants them to. Right at the beginning of the book, when Coach is trying to convince Ghost’s mom that he should be running, Ghost realizes that he’s in a situation that’s played out in loads of sports films. He thinks, “If this went like the movies, I was either going to score the game-winning touchdown (which is impossible in track) or . . . die.” Sometimes you can gauge how good a book is by how self-aware its characters are. But sometimes you just read a book, put it down, and think, “Man. That was good. That was really good.” This is a book that actually made me tear up, and there aren’t a lot of middle grade books that do that. I was rooting for Ghost hard, right until the end. I was caring about a sport that I’d never otherwise think about in a million years. And I was admiring it from start to finish for all that it accomplishes in its scant 180 pages. This is the book you hand to the kids who want something real and good and honest. There are a lot of Ghosts out there in the world. Hopefully some of them will discover themselves here. Run, don’t walk, to pick this book up. 5.0 out of 5 starsGhost is a Major Hit in My Fifth Grade Classroom! I’m currently a fifth grade teacher with the gifted inclusion class. My school is located in a low-income high minority area. My goal this year was to not just choose good books for them to read, but to choose good DIVERSE books. I read about someone saying something along the lines of everyone needs to be able to see themselves in a book and it resonated with me. I think it’s equally important to learn about others and their circumstances too. To make a longer story longer, I wanted to choose something relevant to my students and their lifestyles and I wanted a MC who was African American. I’d read Jason Reynold and Brendan Kiely’s “All American Boy” and when I heard about “Ghost” I knew I wanted it for my students. I chose to read the first chapter aloud to my students and it was a homerun for them from the very first page. They were drawn in by his use of language, writing style, and the plot itself. Castle is lovable and most importantly he’s real. Whether my students are as economically disadvantaged as him, have a family member in prison, or have simply liked a sport or been in an “altercation” at school, every single student identified with him in some way. I pulled articles from online about albinism (to connect to Lu), the effects of a parent being in prison, and about the benefits of participating in after-school programs to show different relationships and connections to the text. It has been a great experience. I HIGHLY recommend this book for middle grades readers and up. Everything about it is worth reading and the end will leave you wanting more! 5.0 out of 5 starsNo Fitness Buff Here, But Reynolds Has Me Sold On The Track Series! 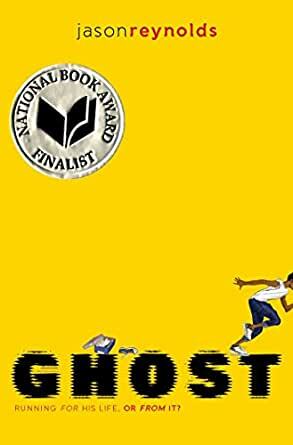 National Book Award Finalist, “Ghost”, is a powerful portrayal of a troubled teen who lacks direction. His choices are often wrong, wrong, wrong, but it’s easy to understand why he keeps making the mistakes he does. Castle Cranshaw has natural talent for running. But he hasn’t been running track; his experience is running for his LIFE! When an Olympic medal-winning track coach sees “Ghost’s” potential, he inserts himself into the life of this angry teen. Castle’s single mother struggles to provide what her son needs, but it takes the challenge of a track team, the support of a coach and a compassionate merchant to unleash what’s been bottled up in the youth for far too long. 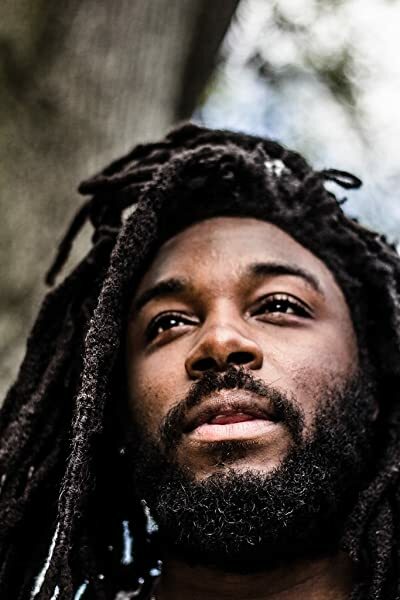 Author Jason Reynolds is no stranger to award-winning books. Three of his works have received the Coretta Scott King award. Reynolds has introduced us to several diverse characters in “Ghost”. This book is the first in the Track series about a talented group of kids who have a chance at the Junior Olympics. They have a lot to prove, though, first to each other......and then to themselves! This inspirational tale is headed to the sixth grade classroom of my daughter, Jen. Not only is she a phenomenal reading teacher, she’s also a track coach. All readers including her reluctant ones will be asking for more books by Reynolds. They’ll eagerly await new titles in the Track series. So will I! Jason Reynolds captures all of the nostalgia of summer reading clubs with this title. The story is a coming-of-age story of sorts that provides realistic portraits of the characters. Written in an easy-to-read tone, the dialogue has a melody that sings across the pages leaving all kinds of rhythm with every turn. Although some of the story can be predicted, it is familiar mainly because the plot is carried out in neighborhoods not unlike ones we have known in our own lifetime. Old-school ways of taking care of children are shared in the story and brilliantly full-circle resolution to typical problems in mentoring are detailed. One of the best parts of the book is that it prepares you for the next one.